Localiza Fleet Solutions is the largest Brazilian player in fleet renting and management. For us, mobility and connectivity have everything to do with customer's productivity, quality and flexibility at a significantly reduced cost. It's being able to get where you want to go in the most practical and safest way possible. Pioneers in this field in Brazil, we take care of the entire company vehicle fleet lifecycle, allowing you to focus on your core business. 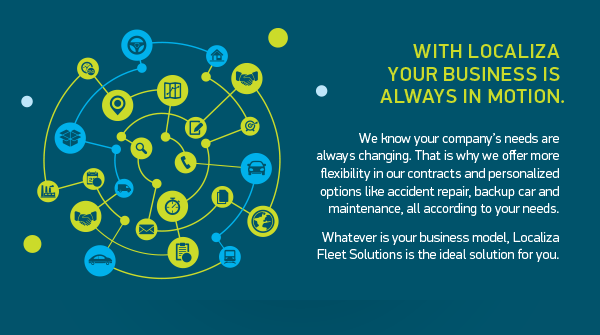 We aim to offer you an efficient fleet renting and technology solution, with a continuous focus on excellence and providing the most advanced online fleet management tools. 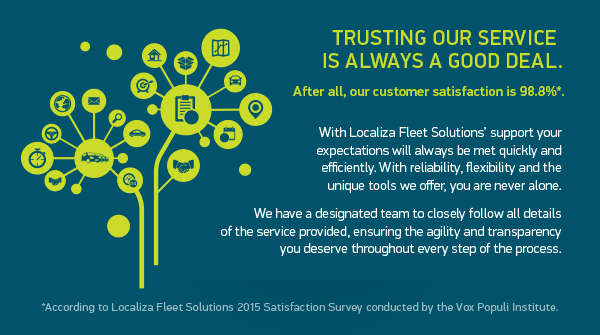 Localiza Fleet Solutions is associated with Global Fleet Services, an international network active in over 70 countries, which allows us to become acquainted with international reputation companies and to exchange information about technology and products. Full service leasing: Our fleet outsourcing model covers everything from the purchase and distribution of cars to fleet personalization, maintenance and accident management, car sales at the end of the agreement and fleet renewal. Maintenance Management: Our service provider network helps us with: preventive and corrective maintenance, installing accessories, mechanical monitoring, manufacturer warranty management, recall management, towing, tire Management and others. 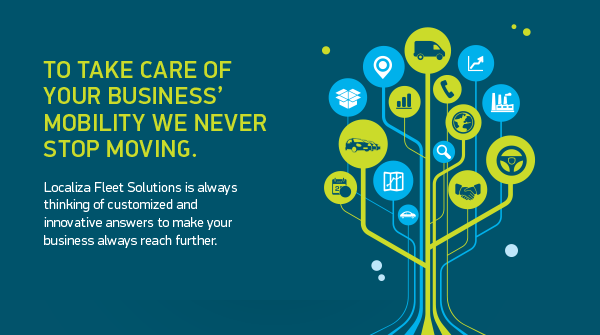 24-hour coverage: Localiza Fleet Solutions is available 24 hours a day, seven days a week, with over 4,000 service providers throughout Brazil and an user service structure that has earned exceptionally high customer satisfaction ratings. Temporary and Replacement Cars: we deliver temporary cars throughout Brazil until definitive car is delivered by the manufacturer and you can contract replacement cars when yours is being maintained and serviced. MyFleetCar: mobile application to facilitate drivers' interaction with our service structure and increase customers' efficiency. Connected Car: telematics system to capture real-time fleet data. This collected data are displayed in an intuitive and practical platform with multiple functions, such as location and identification of all cars, setting of routes and visit plans, among others that make the platform a competitive intelligence tool. Politica de Frotas (Fleet Policy): tool to help fleet managers to develop the car utilization agreement between drivers and company, taking into consideration the particularities of each business. Fleet Dashboard: dashboard that enables the fleet manager to view in a simple and smart way all relevant information about the fleet, such as fleet profile, performed services, accidents and fines. Fleet Consulting: fleet indicators are accompanied by a specialized team that periodically presents action plans for the identified points of improvement. This work promotes cost reduction, productivity gains, sustainability, accident reduction, among others. Data integration: integration of all available data at Localiza Fleet Solutions with data from other service providers, such as fuel card companies, in order to help fleet managers in the decision making process. Fleet Tablet: device to gather all information about MyFleetCar app, Connected Car, Fleet Dashboard, Defensive Driving, Fleet Consulting, guides and institutional videos. All important information in the fleet manager's hands.